I got the following screen when logging in to Google (to use a third-party service) and I was glad to see it. I can’t remember the last time I saw this, but I think it’s something Google should show more often. If you want to deal with this information right now, you can log into Google, go to My Account, and then Personal Settings, and then click on Change password recovery options. Make sure you’ve got at least one recovery email listed there (more would be better) and if you trust Google with your phone number, provide that as well, for SMS recovery. 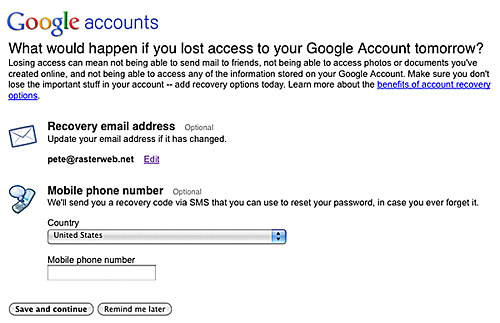 See Also: The Ultimate Guide to Gmail Account Recovery for Password and Security Issues and Account recovery via SMS.